Home » Entertainment » The Botox Mom, The Sun, Good Morning America all Liars ? I am sure many of you would have heard about the Botox Mom story. 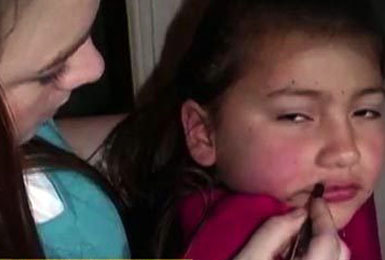 The Botox Mom, Sheena Upton aka Kerry Campbell hit the headlines for injecting Botox for her 8-year-old daughter. Looks like the whole story is a lie spun by The Sun to make a few bucks according to the botox mom’s declaration. After the story ran in The Sun, Upton says she was approached by “Good Morning America” and “Inside Edition” and claims she was offered “a large fee” to appear on camera. She went on both shows and re-told her story. After the interview, child welfare officials took Upton’s daughter away. We’re told the UCLA reports were forwarded to child welfare officials, who then returned Upton’s daughter to her, with the provison that a cousin would stay with her and the child for the time being. As for the declaration — signed under penalty of perjury — we’re told Upton wrote it so her lawyer can secure full rights to custody of her daughter. Wow, how sick can people get? Looks like money always does its job well in bringing the worst out of people. When people say The Sun did something like this, it doesn’t really surprise me. The Sun is a tabloid that has a reputation of such crap.The Sun continues to decline it made up the story. Previous: LinkedIn Stocks Skyrockets 96%! Next: When will the World End?